This example shows how to design a compensator for a Simulink® model using automated PID tuning. This model contains a Water-Tank System plant model and a PID controller in a single-loop feedback system. To view the water tank model, double-click the Water-Tank System block. H is the height of water in the tank. Vol is the volume of water in the tank. V is the voltage applied to the pump. A is the cross-sectional area of the tank. b is a constant related to the flow rate into the tank. a is a constant related to the flow rate out of the tank. 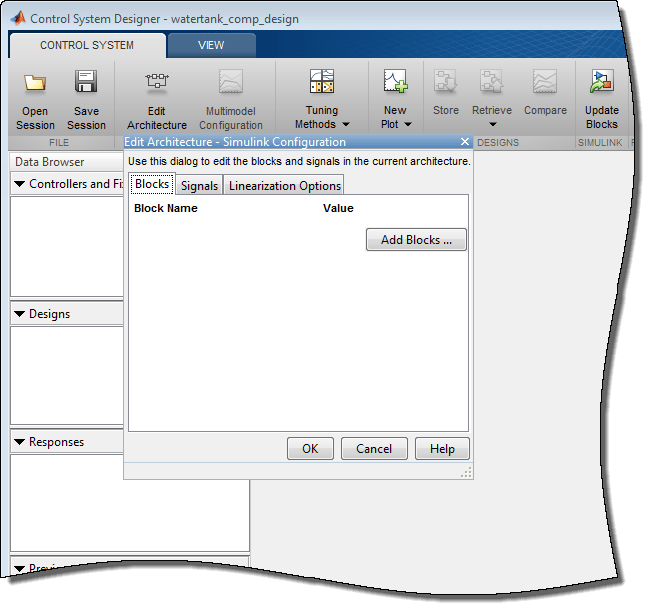 Control System Designer opens and automatically opens the Edit Architecture dialog box. 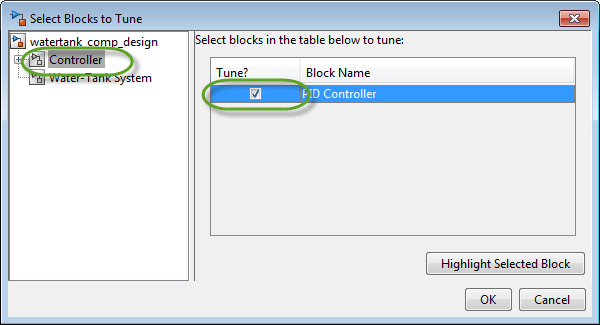 To specify the compensator to tune, in the Edit Architecture dialog box, click Add Blocks. In the Select Blocks to Tune dialog box, in the left pane, click the Controller subsystem and, in the Tune column, check the box for the PID Controller. 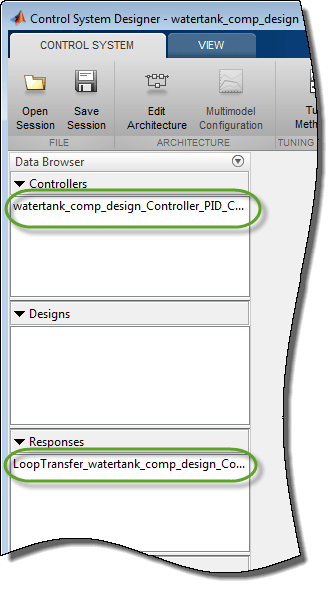 In the Edit Architecture dialog box, the app adds the selected controller block to the list of blocks to tune on the Blocks tab. On the Signals tab, the app also adds the output of the PID Controller block to the list of analysis point Locations. 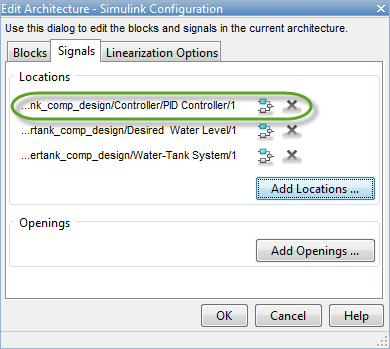 When Control System Designer opens, it adds any analysis points previously defined in the Simulink model to the Locations list. 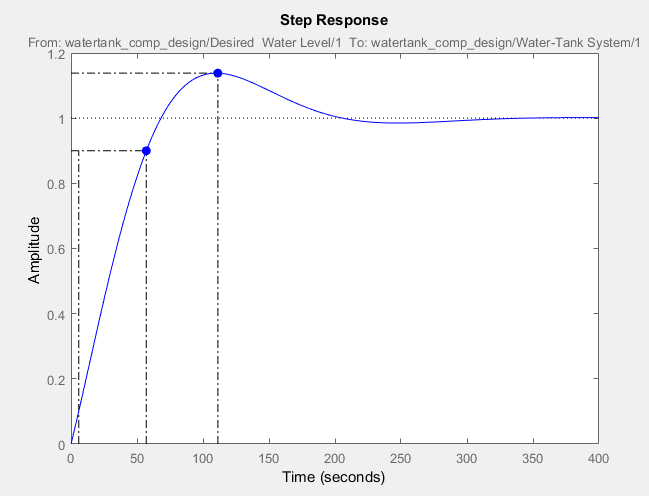 For the watertank_comp_design, there are two such signals. 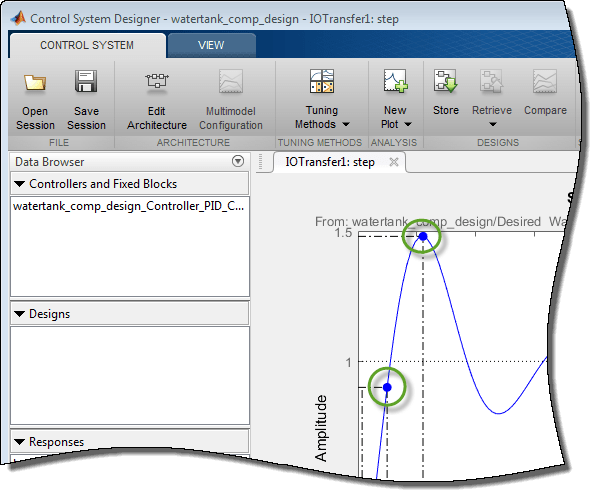 To linearize the Simulink model and set the control architecture, click OK.
By default, Control System Designer linearizes the plant model at the model initial conditions. The app adds the PID controller to the Data Browser, in the Controllers and Fixed Blocks area. The app also computes the open-loop transfer function at the output of the PID Controller block, and adds this response to the Data Browser. 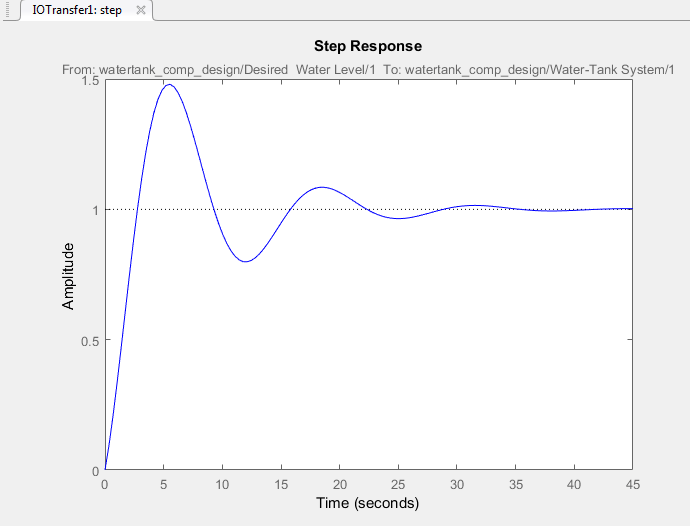 To analyze the controller design, create a closed-loop transfer function of the system, and plot its step response. On the Control System tab, click New Plot, and select New Step. In the New Step to plot dialog box, in the Select Response to Plot drop-down list, select New Input-Output Transfer Response. To add an input signal, in the Specify input signals area, click +. In the drop-down list, select the output of the Desired Water Level block. To add an output signal, in the Specify output signals area, click +. In the drop-down list, select the output of the Water-Tank System block. 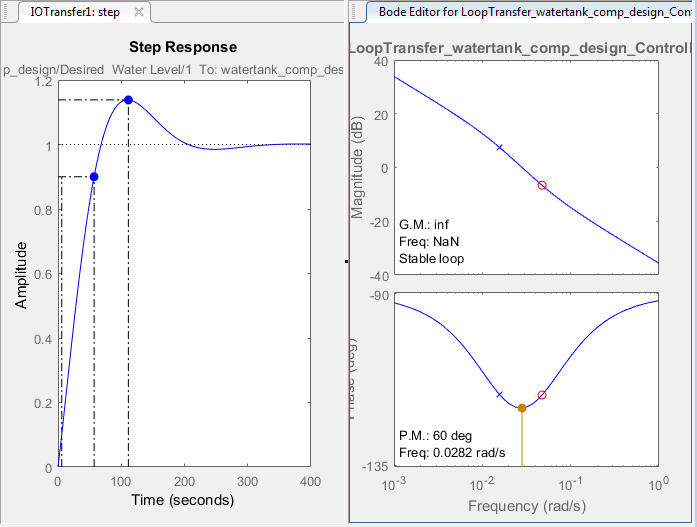 To create the closed-loop transfer function and plot the step response, click Plot. To view the maximum overshoot on the response plot, right-click the plot area, and select Characteristics > Peak Response. To view the rise time on the response plot, right-click the plot area, and select Characteristics > Rise Time. Rise time of 2.13 seconds. This response does not satisfy the 5% overshoot design requirement. To tune the compensator using automated PID tuning, click Tuning Methods, and select PID Tuning. Click Update Compensator. The app updates the closed-loop response for the new compensator settings and updates the step response plot. Rise time of 51.2 seconds. This response exceeds the maximum allowed overshoot of 5%. The rise time is much slower than the required rise time of five seconds. To decrease the rise time, interactively increase the compensator gain using graphical Bode Tuning. 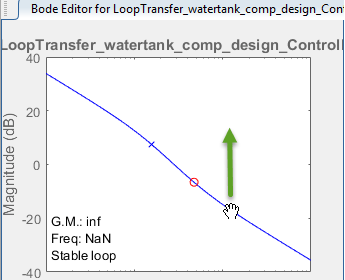 To open the open-loop Bode editor, click Tuning Methods, and select Bode Editor. In the Select Response to Edit dialog box, the open-loop response at the output of the PID Controller block is already selected. To open the Bode editor for this response, click Plot. 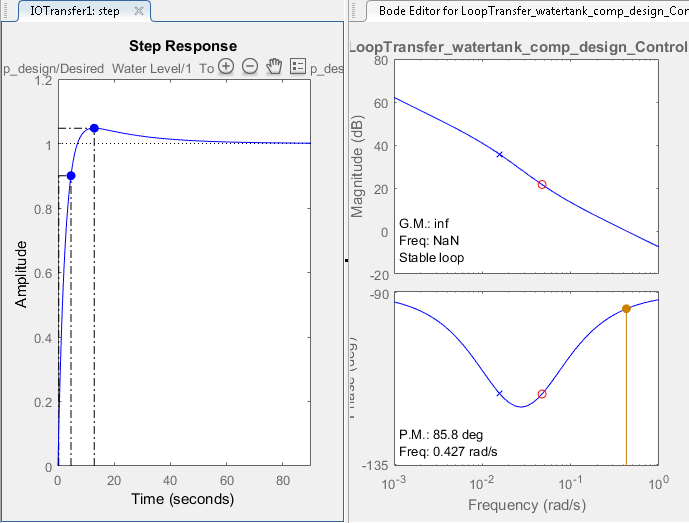 To view the Bode Editor and Step Response plots side-by-side, on the View tab, click Left/Right. In the Bode Editor plot, drag the magnitude response up to increase the compensator gain. By increasing the gain, you increase the bandwidth and speed up the response. As you drag the Bode response upward, the app automatically updates the compensator and the associated response plots. Also, when you release the plot, in the status bar, on the right side, the app displays the updated gain value. Increase the compensator gain until the step response meets the design requirements. One potential solution is to set the gain to 1.7. Rise time of 4.36 seconds. To tune the parameters of your compensator directly, use the compensator editor. In the Bode Editor, right-click the plot area, and select Edit Compensator. 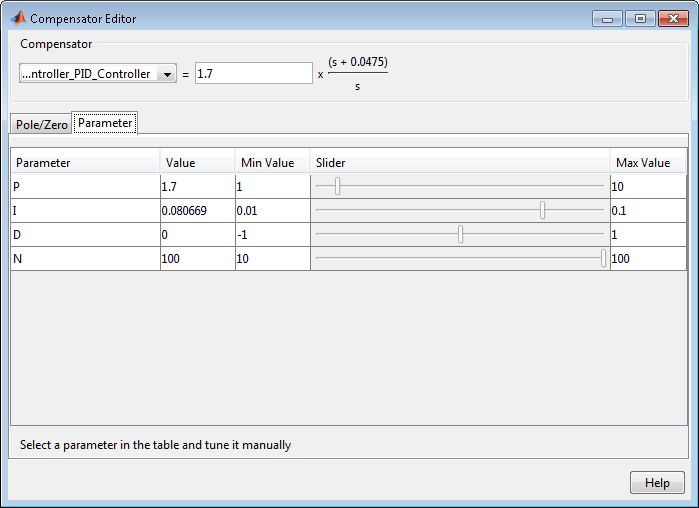 In the Compensator Editor dialog box, on the Parameter tab, tune the PID controller gains. 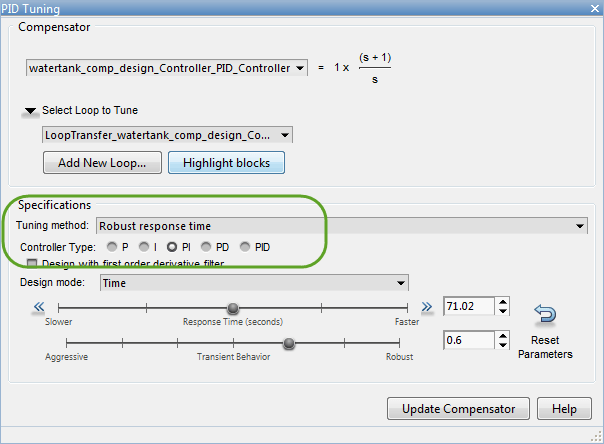 For more information on editing compensator parameters, see Tune Simulink Blocks Using Compensator Editor. While the tuned compensator meets the design requirements, the settling time is over 30 seconds. To improve the settling time, adjust the P and I parameters of the controller manually. Rise time of 1.74 seconds. Settling time of around three seconds. Validate your compensator design by simulating the nonlinear Simulink model with the tuned controller parameters. To write the tuned compensator parameters to the PID Controller block, in Control System Designer, on the Control System tab, click Update Blocks. 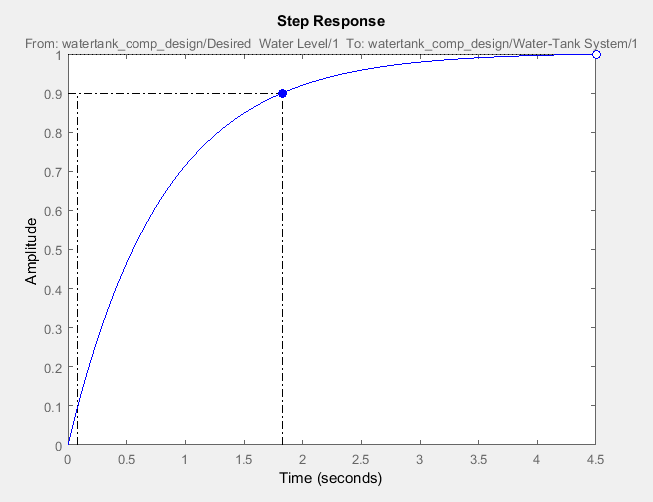 In the Simulink model window, run the simulation. 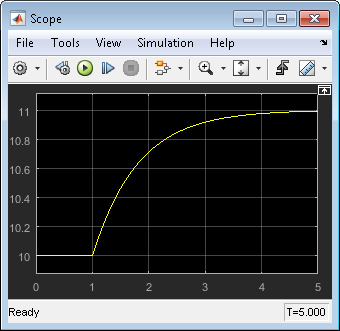 To view the closed-loop simulation output, double-click the Scope block. The closed-loop response of the nonlinear system satisfies the design requirements with a rise time of less than five seconds and minimal overshoot.